You might have noticed I havent been blogging much recently. Sorry about that. I am currently busy reskilling in new areas. Hence a bit of Amazon shopping for relevant reading material. I put a few relevant books in my basket a week or two ago, or maybe less. Imagine my surprise when I came to it today to buy and saw all the prices had shot up. I don’t know if its just a money grab from Wiley or Amazon ‘incentivising’ Kindle purchasing but the price rises are eye watering, Perhaps they are anticipating a new 30% book vat rate in the budget. did they not hear about the recession? did paper just triple in price? Anyone else seen this? Anyone seen other publishers or topic areas (this is finance/trading)? or got an explanation? This entry was posted on Friday, 16th March, 2012 at 10:33 pm and is filed under development, skill, Spreadsheet. You can follow any responses to this entry through the RSS 2.0 feed. You can skip to the end and leave a response. Pinging is currently not allowed. Funny that you mention that. 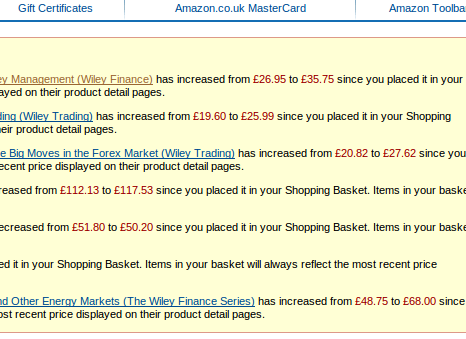 I was looking at a Wiley Finance book on Amazon last night which I’d like to get but it’s not being released until June. It’s RRP is £60 but is being offered at £29. I didn’t want to pre-order for just that scenario. Hmmm, still doesn’t justify raising the prices ‘after’ you have purchased (but not yet received) the books. ITs a funny thought though isnt it? Imagine loading up your real trolley with stuff and then being charged something different when you get to the till. I think Marcus is talking about preordering, in which I have no idea if they respect the price. My stuff was just in my basket and had been for at least a week. I don’t have a problem with the normal price shuffle, its just these were so big and across almost everything in my basket.